As surprising as it is beautiful. This is MY FAVORITE THING! Read these stories slowly. Or read them fast and read them again. Or read them SLOWLY and read them again In fact, maybe never stop reading these stories. Maybe just plan on perpetually reading and re-reading this book (in small doses or large gulps, whatever) to some degree for the rest of your life. 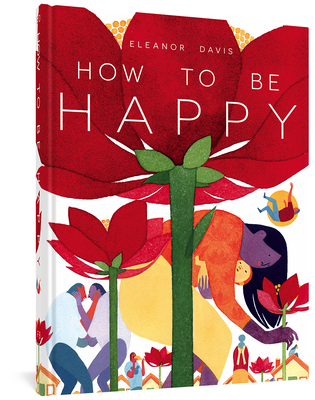 Eleanor Davis'sHow to be Happy is the artist's first collection of graphic/literary short stories. Davis is one of the finest cartoonists of her generation, and has been producing comics since the mid-2000s. Happy represents the best stories she's drawn for such curatorial venues as Mome and No-Brow, as well as her own self-publishing and web efforts. Davis achieves a rare, subtle poignancy in her narratives that are at once compelling and elusive, pregnant with mystery and a deeply satisfying emotional resonance. Happy shows the full range of Davis's graphic skills -- sketchy drawing, polished pen and ink line work, and meticulously designed full color painted panels-- which are always in the service of a narrative that builds to a quietly devastating climax. Named one of NPR's and Publishers Weekly's Best Books of 2014.